I'm wondering if you can tell me how to get the Help information in Final Cut Pro 4.5 to open in Preview, where I can search it easily, rather than in Adobe Acrobat. I'm running OS 10.3.5, so it should open in Preview, but it won't. If I knew where to find the file on the hard drive I would try opening it from Preview, but I can't locate it. I just upgraded to FCP 4.5 from FCP 4.1, but it wasn't opening in Preview in 4.1 either. Jean, switching Final Cut Pro's Help files to open in Preview is easy. However, before you start, be sure that Final Cut is not running. 6. Click the "Change All" button. 11.Close the Get Info box and all windows. 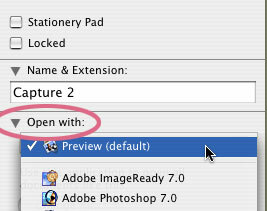 This second technique switches only the files you selected to open in Preview, so when you access help in Final Cut Pro, it will use Preview to open the files. IMPORTANT CAUTION: The files inside the FCP icon folder, which you access using Show Contents are essential to it's operation. 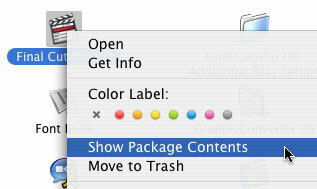 Don't touch, move, rename, or otherwise mess with any other program files or FCP will most likely stop working. This article is from "Larry's Final Cut Pro HD Newsletter," a very cool FREE, monthly, Final Cut newsletter -- subscribe at Larry's web site: www.larryjordan.biz. Larry Jordan is a post-production consultant and an Apple-Certified Trainer in Digital Media with over 25 years experience as producer, director and editor with network, local and corporate credits. Based in Los Angeles, he's a member of both the Directors Guild of America and the Producers Guild of America. Any references to trademarks or products are used for editorial purposes only. Text copyright 2005 by Larry Jordan. All rights reserved.